So I forgot to post this during Christmas time (AGAIN!) but I thought I'd go ahead and share it now so that I can repost it next Christmas :) Growing up we always had a Christmas countdown box that had different activities for each day. 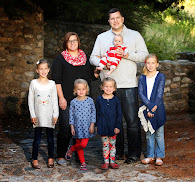 I loved it and had wanted to do it with my own kids. I made this countdown a couple of years ago using craft scraps I had from other projects. I did buy some new Christmas scrapbook paper...because who doesn't like buying new pretty paper! Below I included the materials I used but you could use a variety of materials. I also included the list of what activities we do leading up to Christmas. I try to have a good mix of easy and more involved activities. December is crazy busy so sometimes we only have time to eat a candy cane! Other days the activity might take the whole day. I usually use a calendar and plan my advent calendar around the activities that are already scheduled (like parties, birthdays, school concerts, etc) And I've been known to switch things around the night before if I know we aren't going to have time! We are always looking for fun things to do so after you get some ideas leave a comment with some activities you like to do in the winter too! 1) Cover both pieces of chipboard with a piece of 12x12 scrapbook paper. This paper will be your background. You won't see too much of it so solid colors or a small pattern work great. 2) Use a large piece of ribbon to make the hangar. I cut mine to about 18 inches and attached an end to each of the top corners of the advent with hot glue. 3) Next, cut three pieces of ribbon about 3 inches each. Use these ribbons and hot glue to attach the bottom chipboard to the top. Connecting them with ribbon will allow you to fold the advent in half which makes storing it easy and protects it when you aren't using it. 4) Cut a rectangle 3 inches wide and 4 inches long. Fold the bottom of the rectangle up 1/2 of an inch. Fold the right and left sides of the rectangle in 1/4 of an inch. This will leave you with a folded rectangle about 2 1/2 inches by 3 1/2 inches. Attach the rectangle to the advent by gluing the around the edges on the folded tabs ONLY. This should make a paper pocket on your calendar. 5) Repeat 24 times and glue them on the advent in rows of 4 across. 12 pockets on each chipboard. 6) Decorate each of the pockets with stickers, marker, fabric, buttons, extra ribbon etc. 7) Using the white card stock cut out rectangles measuring 2 in. by 3 in. 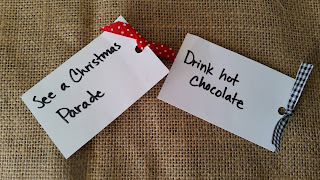 Make a hole punch in the top of each card and tie a small piece of ribbon through the hole. The ribbon helps kids pull them out easier. Write down your winter activities and place one card in each of the pockets on your calendar. 35) Do Christmas dot a dots, crossword puzzles, etc.